Verschenen op 22 maart 2019 bij Warner Bros.
David Cook, Mixer - ADAM SANDLER, Producer, Guitar, Lead Vocals, Writer, MainArtist - Stephen Marcussen, Masterer - Brooks Arthur, Additional Engineer - ALLEN COVERT, Executive Producer - Elmo Weber, Mixer, Additional Engineer - Chris Howland, Recorded by - Lee Pepper, Mixer - Brian Robinson, Co-Producer - Dan Bulla, Producer, Keyboards, Background Vocals, Synthesizer, Programming - Paul Sado, Producer - Jon D'Uva, Recorded by - Benjamin Maas, Recorded by - Nicholaus Goossen, Co-Producer Auteursrecht : 2019 Netflix, Inc. Artwork used with permission by Netflix, Inc. 2019 Netflix Studios, LLC and Netflix Global, LLC under exclusive license to Warner Bros. Records Inc.
David Cook, Mixer - ADAM SANDLER, Producer, Lead Vocals, Writer, MainArtist - Stephen Marcussen, Masterer - Brooks Arthur, Additional Engineer - ALLEN COVERT, Executive Producer - Elmo Weber, Mixer, Additional Engineer - Chris Howland, Recorded by - Lee Pepper, Mixer - Brian Robinson, Co-Producer - Dan Bulla, Producer - Paul Sado, Producer - Jon D'Uva, Recorded by - Benjamin Maas, Recorded by - Nicholaus Goossen, Co-Producer Auteursrecht : 2019 Netflix, Inc. Artwork used with permission by Netflix, Inc. 2019 Netflix Studios, LLC and Netflix Global, LLC under exclusive license to Warner Bros. Records Inc.
David Cook, Mixer - ADAM SANDLER, Producer, Guitar, Lead Vocals, Writer, MainArtist - Stephen Marcussen, Masterer - Brooks Arthur, Additional Engineer - ALLEN COVERT, Executive Producer - Elmo Weber, Mixer, Additional Engineer - Chris Howland, Recorded by - Lee Pepper, Mixer - Brian Robinson, Co-Producer - Dan Bulla, Producer, Keyboards, Writer, Background Vocals, Synthesizer, Programming - Paul Sado, Producer - Jon D'Uva, Recorded by - Benjamin Maas, Recorded by - Nicholaus Goossen, Co-Producer Auteursrecht : 2019 Netflix, Inc. Artwork used with permission by Netflix, Inc. 2019 Netflix Studios, LLC and Netflix Global, LLC under exclusive license to Warner Bros. Records Inc.
David Cook, Mixer - ADAM SANDLER, Producer, Guitar, Lead Vocals, Writer, MainArtist - Stephen Marcussen, Masterer - Brooks Arthur, Additional Engineer - ALLEN COVERT, Executive Producer - Elmo Weber, Mixer, Additional Engineer - Chris Howland, Recorded by - Lee Pepper, Mixer - Brian Robinson, Co-Producer - Dan Bulla, Producer, Keyboards, Writer, Background Vocals, Synthesizer, Programming - Paul Sado, Producer, Writer - Jon D'Uva, Recorded by - Benjamin Maas, Recorded by - Nicholaus Goossen, Co-Producer Auteursrecht : 2019 Netflix, Inc. Artwork used with permission by Netflix, Inc. 2019 Netflix Studios, LLC and Netflix Global, LLC under exclusive license to Warner Bros. Records Inc.
David Cook, Mixer - ADAM SANDLER, Producer, Guitar, Lead Vocals, MainArtist - Stephen Marcussen, Masterer - Brooks Arthur, Additional Engineer - ALLEN COVERT, Executive Producer - Elmo Weber, Mixer, Additional Engineer - Chris Howland, Recorded by - Lee Pepper, Mixer - Brian Robinson, Co-Producer - Dan Bulla, Producer, Keyboards, Writer, Background Vocals, Synthesizer, Programming - Paul Sado, Producer - Jon D'Uva, Recorded by - Benjamin Maas, Recorded by - Nicholaus Goossen, Co-Producer Auteursrecht : 2019 Netflix, Inc. Artwork used with permission by Netflix, Inc. 2019 Netflix Studios, LLC and Netflix Global, LLC under exclusive license to Warner Bros. Records Inc.
Tim Herlihy, Writer - David Cook, Mixer - ADAM SANDLER, Producer, Guitar, Lead Vocals, Writer, MainArtist - Stephen Marcussen, Masterer - Brooks Arthur, Additional Engineer - ALLEN COVERT, Executive Producer - Elmo Weber, Mixer, Additional Engineer - Chris Howland, Recorded by - Lee Pepper, Mixer - Brian Robinson, Co-Producer - Dan Bulla, Producer, Keyboards, Writer, Background Vocals, Synthesizer, Programming - Paul Sado, Producer, Writer - Jon D'Uva, Recorded by - Benjamin Maas, Recorded by - Nicholaus Goossen, Co-Producer Auteursrecht : 2019 Netflix, Inc. 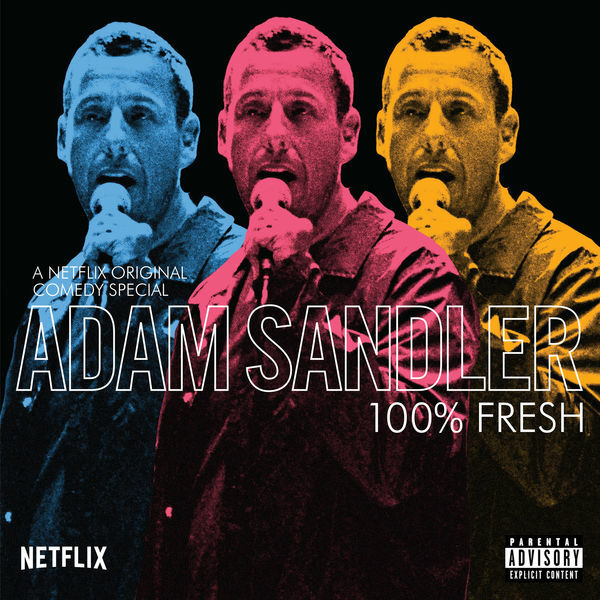 Artwork used with permission by Netflix, Inc. 2019 Netflix Studios, LLC and Netflix Global, LLC under exclusive license to Warner Bros. Records Inc.
David Cook, Mixer - ADAM SANDLER, Producer, Lead Vocals, MainArtist - Stephen Marcussen, Masterer - Brooks Arthur, Additional Engineer - ALLEN COVERT, Executive Producer - Elmo Weber, Mixer, Additional Engineer - Chris Howland, Recorded by - Lee Pepper, Mixer - Brian Robinson, Co-Producer - Dan Bulla, Producer, Keyboards, Writer, Background Vocals, Synthesizer, Programming - Paul Sado, Producer - Jon D'Uva, Recorded by - Benjamin Maas, Recorded by - Nicholaus Goossen, Co-Producer Auteursrecht : 2019 Netflix, Inc. Artwork used with permission by Netflix, Inc. 2018 Netflix Studios, LLC under exclusive license to Warner Bros. Records Inc.
David Cook, Mixer - ADAM SANDLER, Producer, Guitar, Lead Vocals, Writer, MainArtist - Stephen Marcussen, Masterer - Brooks Arthur, Additional Engineer - ALLEN COVERT, Executive Producer, Writer - Elmo Weber, Mixer, Additional Engineer - Chris Howland, Recorded by - Lee Pepper, Mixer - Brian Robinson, Co-Producer - Dan Bulla, Producer, Keyboards, Writer, Background Vocals, Synthesizer, Programming - Paul Sado, Producer, Writer - Jon D'Uva, Recorded by - Benjamin Maas, Recorded by - Nicholaus Goossen, Co-Producer - Tom Costain, Writer Auteursrecht : 2019 Netflix, Inc. Artwork used with permission by Netflix, Inc. 2019 Netflix Studios, LLC and Netflix Global, LLC under exclusive license to Warner Bros. Records Inc.
David Cook, Mixer - ADAM SANDLER, Producer, Guitar, Lead Vocals, Writer, MainArtist - Stephen Marcussen, Masterer - Brooks Arthur, Additional Engineer - ALLEN COVERT, Executive Producer - Elmo Weber, Mixer, Additional Engineer - Chris Howland, Recorded by - Lee Pepper, Mixer - Brian Robinson, Co-Producer - Dan Bulla, Producer, Keyboards, Writer - Paul Sado, Producer, Writer - Jon D'Uva, Recorded by - Benjamin Maas, Recorded by - Nicholaus Goossen, Co-Producer Auteursrecht : 2019 Netflix, Inc. Artwork used with permission by Netflix, Inc. 2018 Netflix Studios, LLC under exclusive license to Warner Bros. Records Inc.
David Cook, Mixer - ADAM SANDLER, Producer, Guitar, Writer, MainArtist - Stephen Marcussen, Masterer - Brooks Arthur, Additional Engineer - ALLEN COVERT, Executive Producer - Elmo Weber, Mixer, Additional Engineer - Chris Howland, Recorded by - Lee Pepper, Mixer - Brian Robinson, Co-Producer - Dan Bulla, Producer, Keyboards, Writer, Synthesizer, Programming - Paul Sado, Producer - Jon D'Uva, Recorded by - Benjamin Maas, Recorded by - Nicholaus Goossen, Co-Producer Auteursrecht : 2019 Netflix, Inc. Artwork used with permission by Netflix, Inc. 2019 Netflix Studios, LLC and Netflix Global, LLC under exclusive license to Warner Bros. Records Inc.
© 2019 Netflix, Inc. Artwork used with permission by Netflix, Inc.
2018, 2019 Netflix Studios, LLC and Netflix Global, LLC under exclusive license to Warner Bros. Records Inc.